While the Virgin Mary probably possessed no gold to smooth her life in the household of the Holy Family, she wears a crown of gold that circles the earth. Flower gardens around the world blaze with golden blossoms that honor her. Every Marigold is s living memorial to her, a token of veneration and praise. We have no certainty how this small golden flower was named for Mary. Perhaps some noble person found it growing in the garden of a Lady Chapel in the 12th century, and was inspired to give it a new name. Or, missionaries to the Anglo-Saxons may have bestowed that title even earlier. Or, reverent Normans may have brought an Old French version of the name with them when they attacked Britain from the continent. In any event, the name of this flower named for Mary was established early in the development of England as a nation, the England that came to be known as “Our Lady’s Dowry.” The early origin of the flower’s title is indicated by the variety of ways in which it was spelled: Marygold, Marygowles, Marigolde, and much later Mary’s gold. Slurred speech eventually shortened the name to a single word -- Marigold. 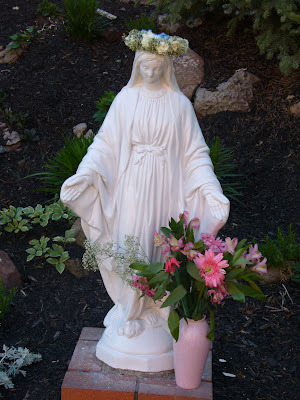 Why this particular flower was selected to honor Our Lady is unknown. History does offer a few clues. Perhaps the most important is that the plant called Marygold frequently appeared in bloom at Ladytide; that is, it bloomed during each of the festivals in honor of Mary. At that time the flower given her name was the most abundant source of golden blossoms. A native of the Mediterranean region, the plant reached Britain early in the Christian era. Angles and Saxons gave it guttural names which survived into modern times as “golds” and “rudds.” But the flower came into prominence only after it was christened as a living memorial to Mary. Few plants have achieved greater esteem. Shropshire housewives even made a special cheese from Marygold. Their base was colored curds of skim milk, about the consistency of cream cheese. Then they added petals of the flower for both color and flavor. 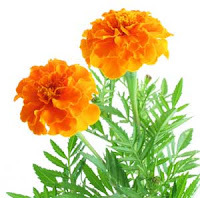 Medieval physicians listed the marigold as a medicinal plant. Boiled with sugar, it was used both internally and externally. A medical book dated 1578 declared, “The conserve that is made of the floures of Mary-goldes cureth the trembling of the harte.” It was also recommended for sprains, wounds, and skin maladies. Even in the wars of the twentieth century, English soldiers were given medicinal oil extracted from modern varieties of the Marigold. Some superstitions arose, but such practices were local and have long since faded into oblivion. Present-day scientists are still awed by the Marigold. Some botanists believe the flower holds the key to a few baffling problems of the plant world. People of science were interested in the golden flower centuries before it attracted the attention of western Christians. To a degree quite unique among medieval plants, Mary’s gold exhibited a strange sensitivity to light from the sun. Every farmer and gardener knew the flower opened its half-shut eyes each morning about nine. For about six hours it slowly turned its head to follow the bright sun. About three in the afternoon it began folding its petals for another night of slumber. Early observers had some interesting theories, but no systematic body of facts. Modern analysts have extended their knowledge of this phenomenon, but still stumble in a corridor enshrouded with mystery. Today botanists refer to the Marigold’s movement as phototropism (light-turning). Most, if not all, plants arrange their leaves, blossoms, and stems in response to light. Conspicuous movements by the Marigold and Sunflower simply dramatize a process taking place more slowly among practically all green-leaf organisms. If the secret of the marigold could be unlocked, we would know how light energy stretching 93 million miles from the sun influences the movement of plants on earth. But that riddle may not be solved in our lifetime. 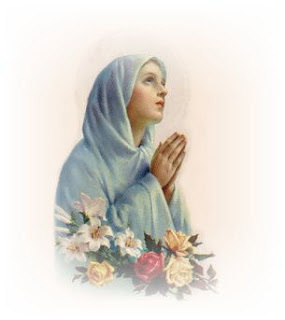 Today few gardeners grow the exact plant to which earlier generations gave Mary’s name. Related varieties discovered in the New World were brought to Europe in the sixteenth century. By 1542 it was recorded that only five American plants were established in Old World gardens. Four of theses were vegetables. The fifth was the Marigold. Although it originated in Mexico, it reached England by two different paths -- one passed through Africa and the other through France. Contemporary flower-lovers usually identify Marigolds into African and French varieties. No matter what its variety, the Marigold is rich in symbolism of Our Lady. The gold petals are likened to rays of light crowning her head, and the prodigal color related to the generous giving of herself to God’s plan. Grief mixed with joy, poverty linked with abundance of good gifts -- that is the Marigold’s reflection of the Lady for whom it is named. If peoples and nations could achieve the spirit of Our Lady, whom this flower commemorates, all life would take on a new meaning and purpose. This ordinary and humble plant serves as a vivid and perennial challenge to new adventures of mind and spirit in fulfilling the Creator’s design. What insect has such a colorful and fascinating history as the ladybird, also known more popularly as the ladybug? In an age of faith when people saw earth mirroring heaven, this tiny creature was thought to enjoy the special protection of the Virgin Mary. Reversing its role in the last two centuries, this small symbol of Our Lady burst into prominence as a protector of people and their food supply. As the enemy of aphids, the ladybird has rendered service calculated in the billions of dollars in the past century alone. We have good reason to be grateful for this little beetle and to the Lady for whom it is named. Agricultural specialists first became interested in the ladybug when California orange groves were mercilessly attacked by a voracious insect pest in the latter half of the nineteenth century. Already in 1880 agricultural experts discovered that a parasitic insect was infesting some orange trees in California’s Santa Clara Valley. The infestation was known locally as “San Jose scale.” Eventually it was traced to the flowering peach trees imported from China. These trees were infected with tiny sap-sucking insects until then unknown in the western world. The deadly visitor insect from Asia found the orange trees a delicious victim and spread quickly. They multiplied so rapidly that they became a mortal threat to the citrus industry in all of California. By 1893 horticulturalists were occasionally finding specimens along the Atlantic seaboard. Five years later the havoc wreaked by these aphids was so grave that the German emperor forbade the importation of American fruits and living plants. In the meantime, the Department of Agriculture had its specialists launch a counterattack. They tried a variety of pesticides, but with little success. Orange trees were dying by the hundreds of thousands. Mr. C. V. Riley, chief entomologist of the Department of Agriculture, suggested that aphids could be controlled by introducing other insects which would prey on them. In 1890 such a proposal seemed radical and preposterous, and drew scoffs even from close associates. But that did not daunt C. V. Riley. Working against indifference and opposition, he was determined to find a creature to attack the aphids devastating the citrus trees of the nation. He learned that aphids caused little harm in Australia, and concluded that some natural enemy was keeping them under control. Mr. Albert Koebele was dispatched to discover that foe of plant lice. He concluded that a variety of the harmless ladybug beetle was the antidote. Gathering ladybugs from Australian plants by hand, Koebele shipped 140 of these plant-saving beetles to an associate in Los Angeles. When set free in an infested orange grove on trees covered with gauze screens, the ladybug liberators cleared these trees of scale within a few days. More ladybugs were imported, and California scientists began to raise them in wholesale quantities. In California citrus groves they brought cottony-cushion scale under control within two years. Following this success, this variety of beetle was introduced to more than thirty countries. Without exception they reduced or eliminated that damage of scale insects which infest citrus trees. So dramatic and conclusive was the ladybird experiment that it marked a turning point in scientific agriculture. From that time hundreds of experiments have been made to find insects which would control insect pests and noxious plants. Economic entomology, now a major operation in several countries, is an outgrowth of the ladybird experiment to salvage California’s orange-growing business. The ladybird, or ladybug, rose to the rescue as the protector of the human food supply. Although this was a new role for the colorful beetle, the bright insect had been well known for centuries. How did it become known as “Our Lady’s Bird?” No one seems to know exactly. In Elizabethan times many common creatures were attributed names with a sacred association. Such names were usually local in character. In the case of the ladybird, another factor came into play. Not only was it a colloquial name employed in a few areas of England, but it found its way into many languages in forms closely related. In German the tiny critter was called Marienhuhn (Mary’s chicken), Marienkafer (Mary’s beetle), and Marienwurmschen (Mary’s little worm). Marienkuh was an earlier form related to the English “lady-cow.” The Swedes used the name Marias Nyckelpiga, and the farmers still call the insect “the Virgin Mary’s golden hen.” A slightly different tack is taken in French and in Spanish. 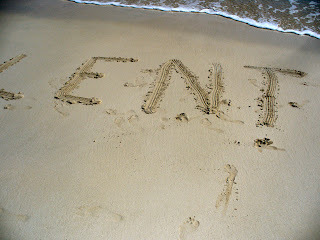 In these languages the names link the insect with the protection of God. The French call it la bête a bon dieu (God’s animal), while the Spanish use the name Vaquilla de Dios (God’s little cow). Both coincidence and cultural exchange fall short in explaining so widespread a view concerning an insect. Scientific names in Latin are common to many nations and languages. But it is extraordinary for folk names to be so closely parallel. Why should people in so many different lands envision the ladybug as enjoying heavenly protection, especially that of Mary? Here is the most reasonable guess. Persons who have grown up in rural areas know that birds and animals almost always leave the ladybird strictly alone, for the ladybird is proficient in chemical warfare. It produces a yellowish fluid which it discharges in time of danger. Though seldom noticed by the blunted human sense of smell, this serum is highly repulsive to foes of the ladybird. Consequently the bright bug goes about its business with virtual immunity from attack. Amazed at the beetle’s sheltered and protected life, the human observers probably concluded that it enjoyed the special favor of the Lady whom they themselves venerated and whose assistance they sought. It seemed natural to call the insect Ladybird. One might also conjecture that people saw a similarity in the creature’s charmed life to the preservation of Our Lady from sin. In the England of that time the doctrine of the Immaculate Conception was a popular belief and prominently discussed. English dialects included variant titles like Lady-beetle, Lady-clock, and Lady-cow. Standardization of speech erased these names, and gradually the capitalization of the first letter was discontinued. Now only the scholarly reader continues to find in this insect’s name a reference to earlier reverence and Marian relation. Farmers of Elizabethan England may not have understood clearly the economic significance of the ladybird, but they knew that it fed on other insects. Hops, long a major crop, are vulnerable to the attack of plant lice. Ladybirds abound in hop fields. They were probably observed in action more closely than the lack of written descriptions would indicate. Not until 1861 did scientific records mention that ladybirds feed on the aphids which infest hops. Folk literature preserves some clues. One is the fact that even today the children of many lands know some form of this rhyme. Children recite that rhyme after a ladybird has been placed on an outstretched finger. This practice has changed little through the centuries as indicated by a woodcut which dates from the reign of King George II. The woodcut depicts a child addressing a ladybird before flight. 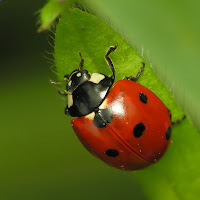 When scientists determined that the ladybird is a natural foe of many plant parasites, they began raising them in special insectaries, especially along the Pacific Coast of the United States, since this region experienced the most devastating attacks by aphids and scales. Experts opine that the ladybird will never become obsolete and outlive its usefulness for agriculture. The life-saver beetle is more efficient for many operations that any pesticide yet devised. Those reared under natural conditions are more abundant and important than those produced by insectaries. In the United States alone at least 350 varieties have been identified. The protective work of the ladybird is responsible for a huge saving annually for the country’s farm economy. Without it, growers would be at a loss to produce substantial crops of needed fruits. With no inkling of its significance in their own era or its future role in world agriculture, medieval farmers reverently named the little beetle Our Lady’s Bird. How appropriate that the creature so named became a protector of our food supply and the symbol of a branch of applied science. Eyes of faith allow us to see that Our Lady’s Bird is in fact a messenger from a provident God. Wouldn't it be wonderful if we could always be mindful of the value and dignity of every individual soul we encounter! 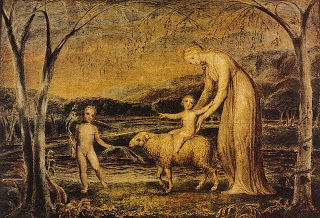 Indeed, it is now clear that the soul of the faithful person, the most worthy of all creatures because of the grace of God, is greater than heaven itself, since the heavens and the rest of creation cannot contain their creator, only a faithful soul is His dwelling place and throne, and this only through the charity that the wicked lack. The Truth says: Whoever loves me will be loved by My Father, and I too shall love him, and We shall come to him and make Our dwelling place with him. 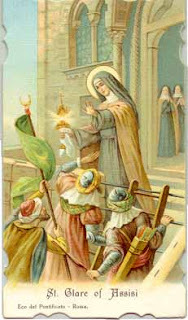 -St. Clare of Assisi, The Third Letter to St. Agnes of Prague. Our Friends at the Big C Catholic Need Our Imput - What Will Heaven Be Like? Big C Catholics Here is the direct link for you to leave your comment: What Do You Think? Watch the religious sisters who taught Oprah the rosary exclusively on EWTN's "Truth in the Heart" every weekday at 5 p.m. ET. In their ongoing series for EWTN, the Dominican Sisters of Mary, Mother of the Eucharist in Ann Arbor, Mich. teach children from Grades 1 to 5 about the Catholic Faith – just like they taught Oprah what it means to be "a bride of Christ!" Learn about heaven, what we'll do in heaven, how to get to heaven, what a hero really is, and much more. Catch the joy of the sisters which has caused many lapsed Catholics to reconsider their lost faith and increased the number of young women going to the sister's discernment retreat from 70 to 135! Just a reminder that we can begin the Novena for St. Joseph today and it will end on March 18th. 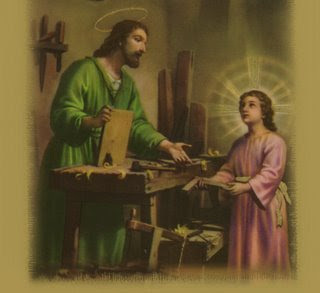 St. Joseph's Feast day is next Friday, March 19th. The Novena to St. Joseph on EWTN's site here is a good one. BTW, if you still have not read any of the cardinal's books, for what are you waiting? 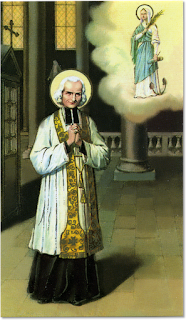 There are some very good examples of saintly mortifications in the St. John Vianney's catechism of the Cardinal Virtues. 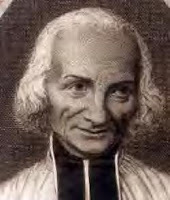 ...Temperance is another cardinal virtue: we can be temperate in the use of our imagination, by not letting it gallop as fast as it would wish; we can be temperate with our eyes, temperate with our mouth – some people constantly have something sweet and pleasant in their mouth; we can be temperate with our ears, not allowing them to listen to useless songs and conversation; temperate in smelling – some people perfume themselves to such a degree as to make those about them sick; temperate with the hands – some people are always washing them when it is hot, and handling things that are soft to the touch.... In short, we can practice temperance with our whole body, this poor machine, by not letting it run away like a horse without bit or bridle, but checking it and keeping it down. Some people lie buried there, in their beds; they are glad not to sleep, that they may the better feel how comfortable they are. The saints were not like that. I do not know how we are ever to get where they are.... Well! 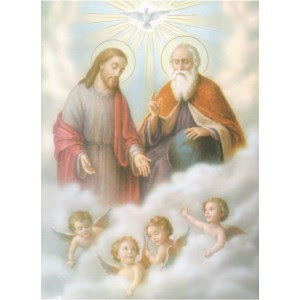 if we are saved, we shall stay infinitely long in Purgatory, while they will fly straight to Heaven to see the good God.